Eigen Engineering offers several important value added services in addition to our tooling services to give you an end-to-end experience. Some of these peripheral services offered are the following. Investment in friction welding equipment is often uneconomical when the production batches are small. Eigen Engineering is the preferred partner in such cases where we place the expertise of our engineering team and experienced technicians at your service. We assure quality welding jobs are done in a professional and aesthetic manner. This process uses high-frequency sound waves – usually in the 20-400 KHz range – along with water or some cleaning solvent, to clean the components. The process uses cavitation bubbles created by the sound waves, through the solvent the component is immersed in, to give a deep as well as an intricate cleaning of delicate components. This is a quick polishing process that gives a fine finish to small components. In this method, the components are placed in a barrel which is in turn placed at the end of a rotating arm and ‘tumbled’ to achieve a smooth polish. This is a process in which two metal surfaces are joined by the heat obtained from resistance due to passing a current through them. This is a localized process as the two metals melt and the weld happens only at the point or spot through which the current is passed. 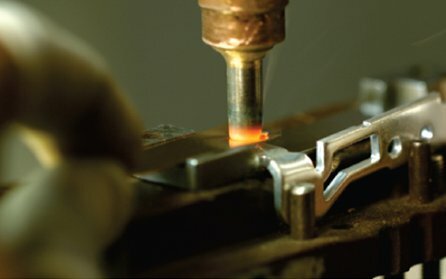 This is a precision welding technique where the temperature of the welded components is an important factor to consider during the manufacturing process. Some tool components require characteristics such as high surface hardness, resistance to extreme temperatures, higher ductility and strength, and so on. The microstructure of the material – be it steel or aluminium – needs to be altered. This can be achieved by using a controlled process called heat treating. As one of the forerunners in the industry, Eigen Engineering offers an extensive range of thermal processing services, ranging from annealing, case hardening and normalising to Speciality Stainless Steel processing. Case hardening with subsequent hardening operation: This process involves infusion of elements onto the material surface in addition to other processes in order to control the sequential impact of the hardening. Case hardening without subsequent hardening operation: This process involves infusion of elements onto the surface of a metal without the addition of any other sequential processes in order to form a thin layer of hardened alloy. Hardening and tempering: Hardening and tempering is a two stage process. Hardening is used to imbue the components with specific mechanical qualities. Tempering is used to remove the brittleness and stress caused by quenching. Ageing: The strength of a metal is increased by a process called ageing, which produces precipitates of the alloying material within the metal structure. Specialty Stainless Steel Processes (S3P): The surfaces of stainless steel, nickel, cobalt and chromium alloys are hardened to increase strength, exhibit better wear and tear resistance, and more. Annealing/Normalising: The process of annealing reduces hardness, enhances ductility and eliminates internal stresses. Ion implantation: Ion implantation is a process in which we bombard surfaces of the metal with a high energy ion beam in order to improve friction coefficient, adhesive wear and surface hardness of polymers and metals. Stress relieving: This is the process of reducing stress in the structure of the material in order to reduce the risk of changes to dimensions during the further steps in the manufacturing process. This is the process of coating a material with a titanium nitride oxide layer to increase the absorbance of the material. Eigen Engineering is equipped to provide such selective coating services as per your requirements.